It’s hard to take a photograph that does it justice. 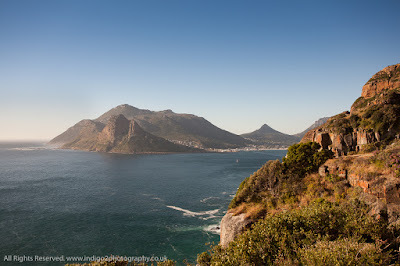 This is one of my favourite views in the world, looking toward Hout Bay from Chapman’s Peak Drive. You stand there with the wind plucking at your clothes, enveloped by the smell of fynbos mixed with sea air and you feel the heat radiating from the rocks and ground around you. Your heart beats a little faster as you try to take in the immense grandeur of the Cape Peninsula at the South Western tip of Africa. How can you put this experience into an image? One way is to add a description, as I have done here. Captions are immensely important. But a photographer has other tools as well. Using the language of light, composition, colour and gesture all help us convey the feeling of what was like to see what we saw and photographed. It's a real challenge and something to think about.